Long before fishing reels were invented, the cane pole was the tool of choice when it came to angling. Today, cane poles are viewed as old fashioned or too low-tech by many mainstream anglers, but the cane pole is actually a useful tool to have in your fishing arsenal. While so much of today’s fishing tackle is on the cutting edge of technological advancements, sometimes a little low-tech can offer options that modern spinning or baitcasting rigs cannot duplicate. As most anglers know, a cane pole is little more than a long stick with line tied at the end. You cannot cast line nor retrieve it, but the cane pole allows you to reach places that are tough to access with a standard rod and reel, and it opens the door to a few techniques that are surprisingly effective in taking fish. A steady, though small, number of anglers continue to purchase and use cane poles. A few manufacturers offer actual poles made of cane, while other offer modern versions made from fiberglass or aluminum. Most break down or telescope for easy storage and transport. There are many benefits to using a cane pole and they cross many forms of fishing from trout to largemouth bass. While fly fishing rules when it comes to steam trout angling, the cane pole can be a useful companion piece to a fly rod. This is especially true when fishing tight, overgrown stream sections that make fly casting nearly impossible. The cane pole allows you to reach your fly or other bait into a tight area and present it to the fish without worrying about tangling with brush and trees. The cane pole also offers a twist on fly presentation, which can be extremely effective in enticing trout to bite. When presenting a fly with a cane pole, you can skate a dry fly in different directions over the water and repeatedly lift and drop your fly on the water, a technique which seems irresistible to trout. The cane pole also offers another option for largemouth bass anglers to access fish in habitat that is tough to get to with a rod and reel. 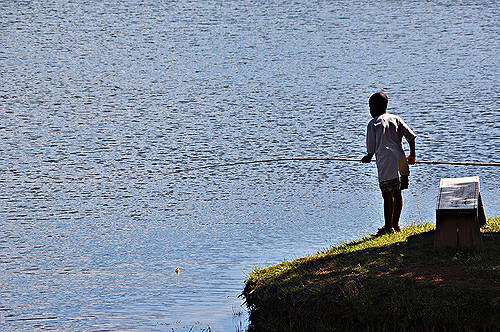 If you have thick cover, such as a tangle of brush, deadfalls or thick weed cover, which are difficult to cast to, you can drop your bait right to where the fish are hiding, by using a cane pole. This technique can be used with live bait, jigs, top-water lures or any number of other bass baits. Most fishing for panfish is done within a short radius of a dock or boat. The cane pole allows you to reach these short distances without having to cast. This makes the cane pole especially attractive for kids, who do not have to worry about tangling line on a reel or casting accurately. Just plop your bait where you want it and pull the fish up and out of the water. Landing a fish with a cane pole takes a bit of practice, because it takes a different technique, especially with bigger fish. With a cane pole, you have to pull the fish up and out of the water. Big fish can be a real challenge and landing them often involves dropping the tip of the cane pole into the water to reduce the stress on the rod as you are battling them.